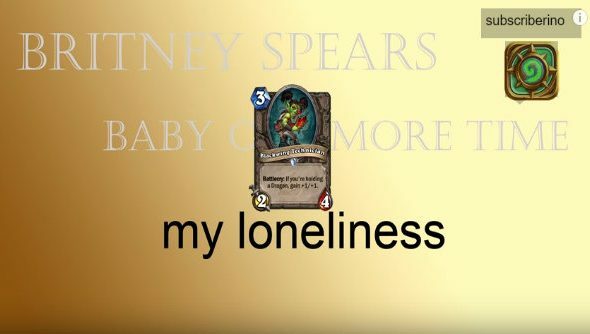 Someone has recreated a good portion of Britney Spears’ late ’90s pop banger ‘One More Time’, in Hearthstone. Yes. I wonder what songs could be made from our list of best Hearthstone decks. One More Time might have been the last song to ever be featured on BBC’s Top of the Pops before it was cancelled, but this rendition brings it smack bang up to the modern day, funneled through the vocal snippets of a bunch of fantasy creatures in a card game. That isn’t creatorGrün Ling’s first Hearthstone pop song rodeo, though. Have a look at this Hearthstone spin on Erasure’s synthpop hit Always.